The blacklegged tick (ixodes scapularis), also known as a deer tick, is expanding its range and can carry and transmit Lyme disease as well as a number of other ailments. Photo source: Northwestern Health Unit – NWHU in Ontario, Canada. Lyme disease was first identified in Lyme, Connecticut in 1975 and its presence has been tracked ever since. Better awareness, elevated deer populations, tick migration due to changing environmental conditions and the growing popularity of spending time at recreational properties in wooded areas are all resulting in an increase in the number of confirmed human cases of the disease. Lyme disease symptoms include fatigue, headaches, fever and most importantly, a bull’s-eye type rash that often develops and expands around the bite. If detected early enough, Lyme disease can normally be treated using antibiotics. If the disease is not diagnosed and goes untreated it may spread to the nervous system, heart and joints of the infected person. Deer ticks have black legs and the body ranges in colour from dark brown to black with the back of the females being red to orange. Blacklegged ticks are smaller than wood ticks and will feed on humans in the larva, nymph and adult stages. Their small size makes them difficult to discover. In its nymph stage, which tends to be the cause of most infections, the blacklegged tick is about the size of the head of a pin or a poppy seed. Around the cottage ticks are found in damp wooded areas and in long grass. When you plan to spend time in known tick infested locations it is best to take some precautions before you go, while you are there and after you return. The best way to keep ticks from biting and avoid getting a tick-borne disease is to make sure ticks don’t get a chance to attach themselves to your body. By following a few simple guidelines, you can enjoy the outdoors and stay tick-free. Wearing an insect repellent with a high concentration of DEET can be effective when applied directly on your skin and clothes. This one appears to be popular. Dress in a way that prevents ticks from easily accessing your skin. Wear rubber boots, tuck socks and shirts into your pants, and wear a hat. Ticks move a lot faster than you think so it is important to catch them before they make it to an ideal feeding spot on your body. Before you go back into the cabin, do a thorough check of your clothes to see if any ticks have hitched a ride while you were working outside or walking in the woods. Once you are sure the ticks are not on your clothing it is important to have a shower and do a full body inspection for any ticks that might have made it to your skin. Some of the favourite spots for ticks include the waistline, belly button, back, arm pits, ears, behind the knees and in your hair. Found an attached tick – now what? Despite taking all the proper precautions, it is possible that a tick may find its way to your skin. The tick may be brought into the house or the cabin by the dog, a mouse, or even by simply hitching a ride on a piece of firewood. If you are concerned that it may be a dangerous tick, take a picture before you remove it. It is important to remove an attached tick as soon as possible. The recommended way is to use tweezers to grasp the tick as close as possible to the skin and pull it straight out in a firm but smooth motion. You want to avoid breaking off the head and leaving part of the tick embedded. The local health unit in your area may have a handy tick kit which will consist of tweezers, disinfectant, a booklet with identification and removal directions, and a small container for transporting the tick back to the lab to be tested for diseases. Never remove a tick by trying to burn it with a match, dousing it with gasoline, or covering it with nail polish. These actions may actually cause the tick to transmit a disease into your system if it hasn’t already done so. What does a deer tick bite look like? If you have a bite that you suspect was from a tick it is important to watch the site carefully. 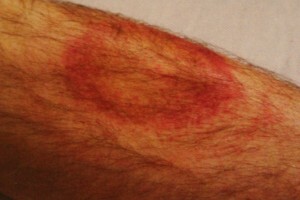 The bite from a black-legged tick or deer tick will often create a circular bruising or red ring pattern on the skin around the actual point where the tick has fed. The bite can be followed by a growing rash. In the following days and weeks after being bitten by a tick it is important to be vigilant for disease symptoms such as fever and an expanding rash. Document the progression of a rash by taking photos. Get medical attention if you suspect the tick may have passed on an illness. When you visit the doctor be sure to mention the bite as well as when you think it happened and where you were when you picked up the tick. Bring your pictures in the event that the rash has faded or disappeared. Cottage living tends to be right smack in the middle of prime tick habitat but we can do a few things to reduce the risks. Keep the grass cut short all around the cabin. Rake up and burn or dispose of last year’s leaves and remove any underbrush that may be favourable to ticks. Plants that may attract feeding deer should be removed. Short of putting a fence around the cabin, it is pretty much impossible to keep deer away in most of cottage country, but there are a variety of devices and techniques that cottagers use to keep the deer away. Adult blacklegged ticks feed mostly on deer, so it is important to keep the deer in the woods. When female adult ticks have finished feeding, they drop off the deer and deposit their eggs near the spot where they land. If the deer are frequenting the cottage property the female tick may drop off close to the cabin and lay her thousands of eggs close by. The eggs will hatch into larvae and begin feeding on the resident rodents, especially mice. Rodents carry the ticks that are in the larvae and nymph stages of the life-cycle. The blacklegged tick will feed on humans in each of its life-cycle stages, so it is important to reduce the amount of favourable habitat around the cottage for the critters that will carry the ticks. This includes mice and chipmunks. Mice tend to be the main culprits although the eastern chipmunk can also contribute to the spread of the disease. 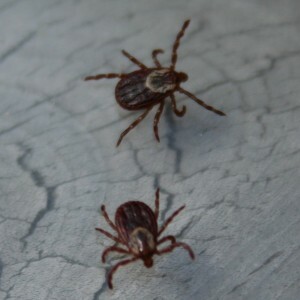 They are bitten by infected ticks and then transmit the Lyme disease bacteria to other ticks that feed on them. In some areas where Lyme Disease is endemic, up to 90% of the white-footed mice may be carrying the bacteria. Unfortunately, the white-footed mouse looks a lot like the common deer mouse. Brush piles should be removed and burned. Firewood stacks are best kept in the woods at a safe distance from the cottage. Garbage such as old mattresses and spare construction wood should be cleared out from underneath the cabin, work shed and gazebo. Old leaky boats and retired lawn tractors should be taken to the dump. Holes around the foundation of sheds and other outbuildings should be sealed to be less inviting to critters. The same applies to the cottage, although it is nearly impossible to keep out all the mice. Any situation close to the cabin that would make a good home for rodents, skunks, raccoon, etc. should be eliminated if at all possible. There are a few things you can do to stop ticks from coming near or into the cottage. Wood chips, sawdust, and small stones or gravel can be placed between the forest and the common area of the property to help prevent ticks from making their way closer to the cabin if they are not hitching a ride on an animal. The best way to protect the dog is to keep it away from the ticks. Daily inspections of the dog’s fur and skin along with the use of a tick pesticide will help keep your pet protected from tick-borne diseases. Tick collars, sprays and powders are all available. There is also a Lyme disease vaccine for dogs in case your pet is going to be spending an extended time in a tick infested area. Consult a veterinarian in the area you plan to visit to get the best local prevention advice. Where are Lyme disease ticks found in Canada and the U.S.? According to the PHAC – Public Health Agency Of Canada, the blacklegged tick is currently found in Manitoba, Ontario, Quebec, New Brunswick and Nova Scotia. A variation called the western or pacific blacklegged tick is found in British Columbia. The CDC – Center For Disease Control in the U.S. says the blacklegged tick population carrying Lyme disease is widespread through the upper Midwest and eastern United States. The pacific blacklegged tick is found along the pacific coast as well as in Utah, Arizona, and Nevada. There are a few other ticks that are known to feed on humans. The American dog tick is also known as a wood tick and is widespread throughout Canada and the United States. It is the most common tick found across Canada. This tick is not known to be a carrier of Lyme disease. In certain areas, a cousin of the American Dog Tick called the Rocky Mountain Wood Tick transmits Rocky Mountain Spotted Fever. This disease is normally found in western Canada and the northwestern United States. 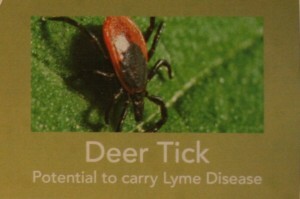 The Lone Star Tick is located in the southeastern and eastern parts of the United States. Identified by a distinct spot on its back, this tick can transmit STARI – Southern Tick-Associated Rash Illness. Only ticks that have fed on an infected host can carry a disease. Do Infected Ticks Always Transmit The Disease? The chances of being infected and getting Lyme Disease from a tick depend on the infection rate of the tick population in the area where you encounter the tick. According to the CDC, an infected tick has to be attached and feeding for at least 24 hours before it can begin to transmit the disease to its human host. The Canadian Lyme Disease Foundation is a good place to get more information. Go to the Cottage Insects And Bugs page to get information on other pests at the cottage.